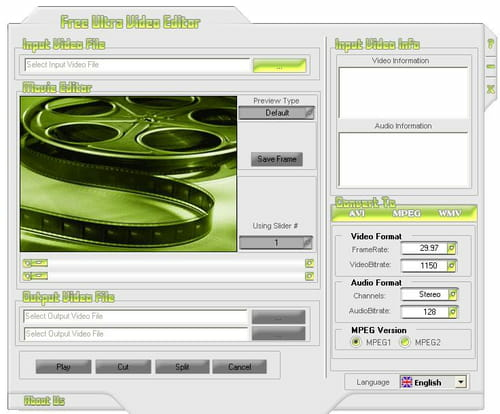 Video addicts would love Free Ultra Video Editor , an editing video software. You can modify videos and convert them into different formats. Nevertheless, the software can be used as a video player. Its high quality resolution makes the difference among other editing video software. Free Ultra Video Editor can add visual effects on your video. Only select the input video file and you can easily modify it. The user can select only a few part of the video. It is important to note that the saved files might be into the following formats : AVI, MPEG1, MPEG2, WMV, AS. Whereas converting videos with others application takes a while, you can make it quickly with Free Ultra Video Editor. If you implement the application to the videos one by one, you will spend several minutes even hours on it. The software can convert multiple video files at once. All you need to do is to select the videos. Apart from editing videos ,you can watch videos with high quality resolution. The application supports different formats (AVI, MPEG1, MPEG2, WMV, AS). The software is a very easy to use editing video software. The interface should be enhanced. Latest update on November 20, 2016 at 04:03 PM.